Who brought back the use of rarely utilized Paladin secrets? “None of your business.” Mysterious Challenger brought Paladin secret back into the light with his unique Battlecry. 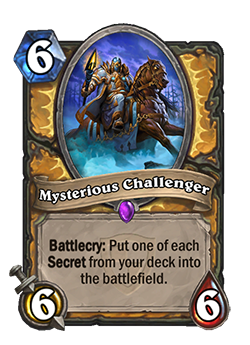 Previously, Paladin secrets were rarely utilized in most Paladin decks, but Mysterious Challenger is a good example of a card that can have an immediate impact on bringing older cards back into the fray. Sometimes having a deck full of secrets doesn’t work out if you end up drawing a lot of them in your opening hand, but sometimes the Challenger comes riding into battle and makes a big, immediate impact on the game. From there, it becomes more of a puzzle for the opponent to decide how they are going to deal with the board. 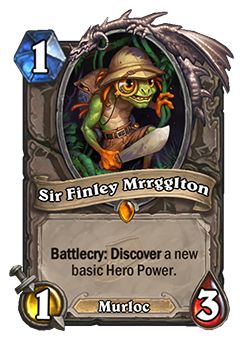 The gentlemanly scholar Sir Finley Mrrgglton has demonstrated that even changing something as simple as your Hero Power can create an entire new world of deck-building strategies that didn’t exist previously. Both Warriors and Shamans can adjust from having a more defensive or control-based playstyle to a more offensive one with the right Hero Power, while Hunters have more options of a control-based playstyle. 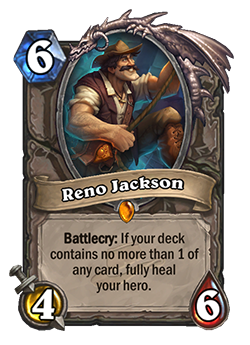 Other classes can also benefit from different deck-building options with Finley, encouraging new cards to come out of “retirement”.